As the holidays approach and life speeds up even more than usual I can think of a number of people I could gift this bag to with a nice bottle of wine or sparkling grape juice to get a handle on things and realize that it's not a disaster if everything doesn't go perfect all the time. 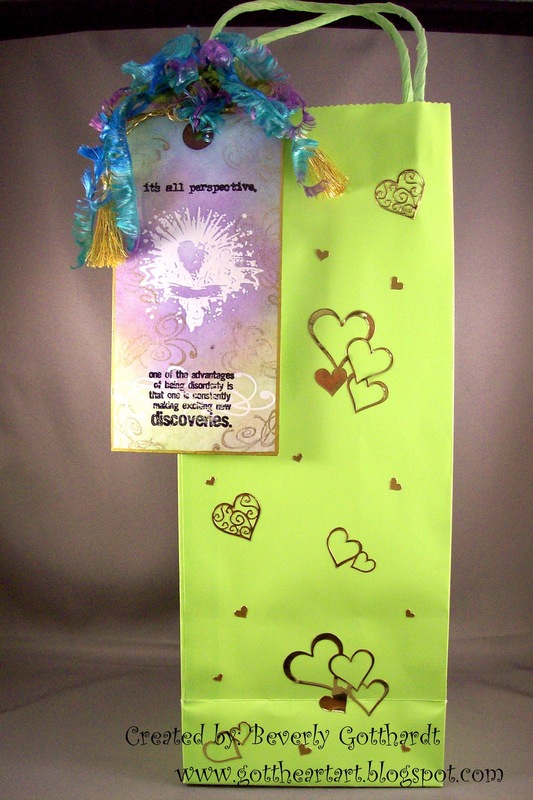 I used a white glossy tag with some VersaMark ink and clear embossing powder, distress inks blended around, stamped my black sentiments, and then some gold swirlies, added the fou fou yarn and gold tassels, some Paper Studio stickers on the bag. Bingo! a nice little gift from the ♥. 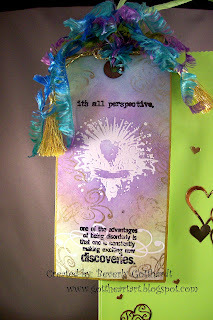 My friend Annette came over and suggested that I enter this tag in the Gingersnap Creations challenge this week. It just happens to be to use VersaMark. I went over and looked around their site, very arty, and lots of talent. I will keep a close eye over there and might start entering more often. I have put them on my Wednesday side bar, so if you haven't found them hop over and check them out and check out Annette also, she's a visiting artist at Gingersnap Creations this month. Encore-gold metallic, Stampin Up-clear embossing powder, Sharpie Poster Paint Pen-gold, Darice-gold tassels, The Paper Studio gold peel off stickers, $ Store yarn. Beautiful tag! Love the resist image! Thanks for playing the Gingersnap Creations Versamark Challenge! What a fabulous tag!! Thanks for playing along with us at DDCC! Gorgeous tag, really like all the bright colors you used! Thanks for joining us at DDCC!!! I am glad that Netty sent you over to GC, because we can't get enough great art! Love your tag!! Love the wonderful Versamark resist ... and what a great gift idea ... thanks for celebrating Goth-tober with us at Gingersnap Creations. what a beautiful tag - love how you used the Versamark! Thanks for including Gingersnaps in your sidebar.